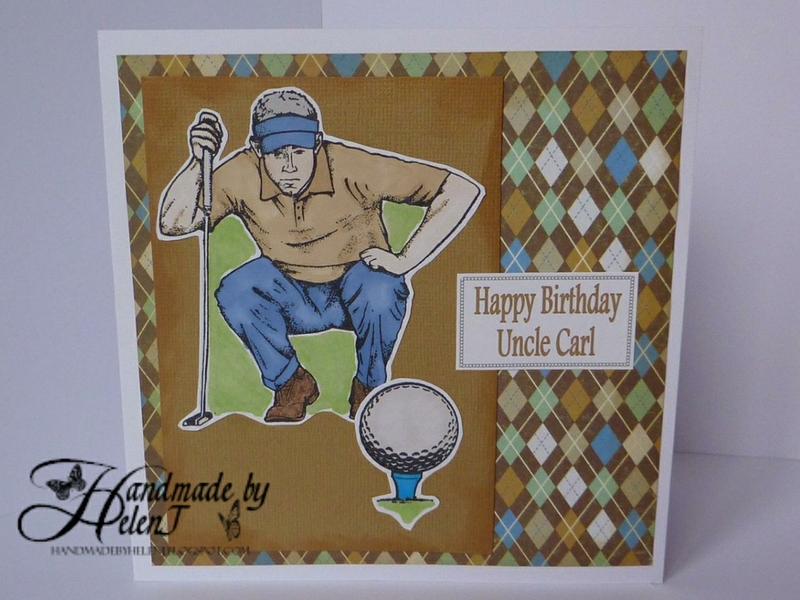 Like most cardmakers I find making cards for men amongst the most difficult to do. These were for my brother-in-law for his birthday. 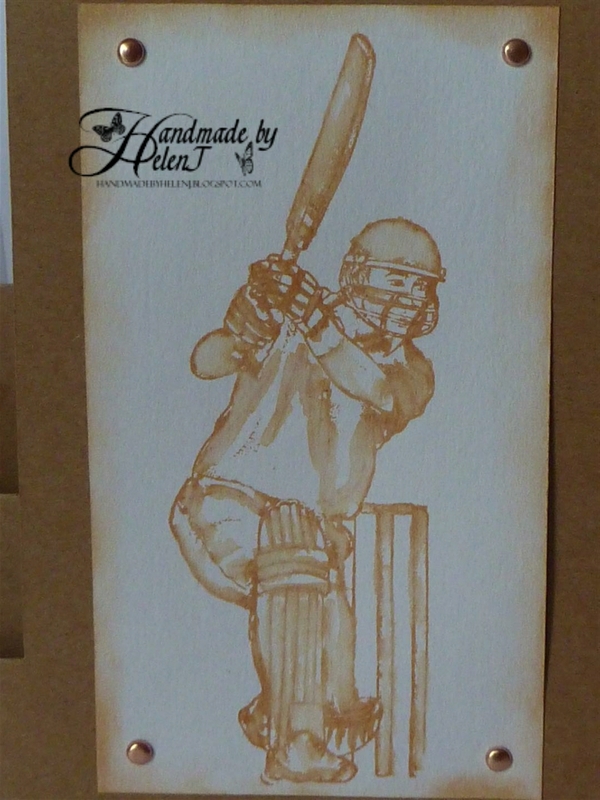 Stamp by Craft UK, coloured with Promarkers (sandstone, china blue, leaf green toned down with warm grey 1) and dark brown Coloursoft pencil for shoes. Stamps by Craft UK, stamped then “watercoloured” in Tea Dye distress ink. Close up of card above. 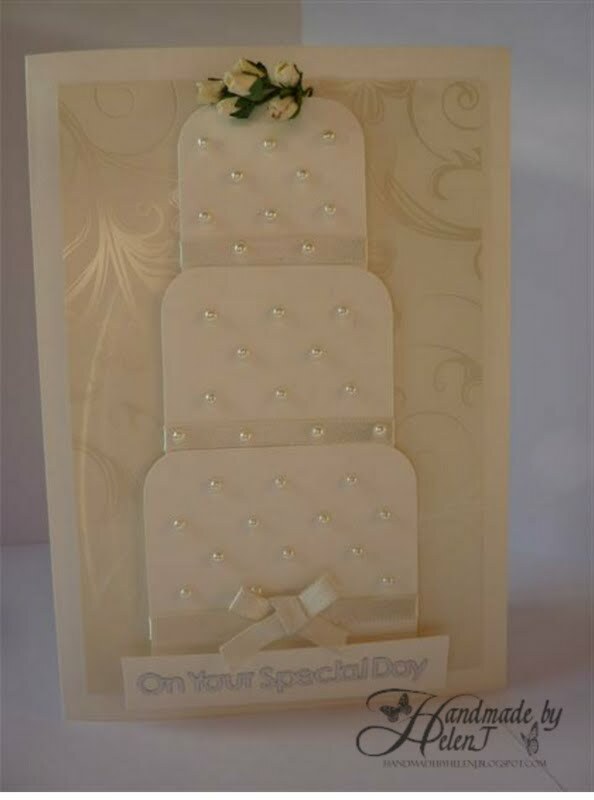 This card was a commission; I kept it simple, creating the word art in Craft Artist Professional, mounting it on card embossed in the Cuttlebug, with ribbons & pearls to finish. Scriptina font for capitals with Felix titling for remaining text; Cuttlebug D’vine Swirls embossing folder. This was a very quick card to make because I cheated! My mojo had deserted me but then I saw this card created by Michelle Short, a cardmaker whose work I’ve admired for a long while. I already knew which stamp I wanted to use so the rest was easy. What is it they say? Imitation is the sincerest form of flattery? 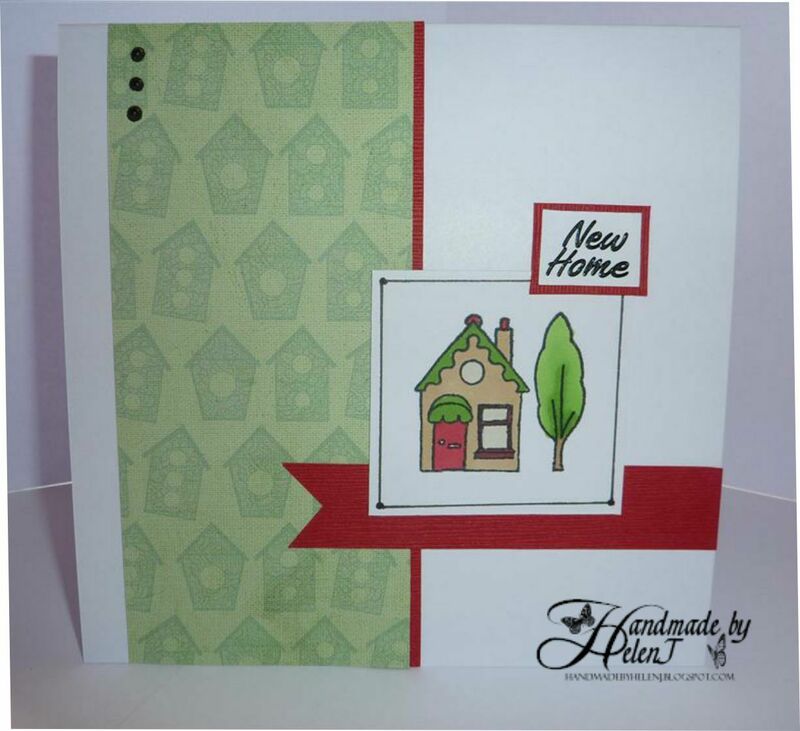 Free stamp from Craft Stamper magazine, coloured with Promarkers. Backing paper from Craft Artist Professional. Pearls made using Waco Pearl Maker. Peeloffs used for greeting. Some good friends of ours were married (at long last!) the other day. Such a special occasion deserved a special card, and this was based on a wedding cake I saw in a magazine the bride was using for inspiration. Pearlised card from the Papermill Shop, flowers from Crafts4u2do, Hunkydory patterned card. I always struggle to make Valentine’s cards for my husband; anything too romantic would be a big mistake so I spend ages searching the internet for inspiration. This year my inspiration was the second card in the set shown here. Ink: DewDrop Pearlescent Poppy Brilliance. 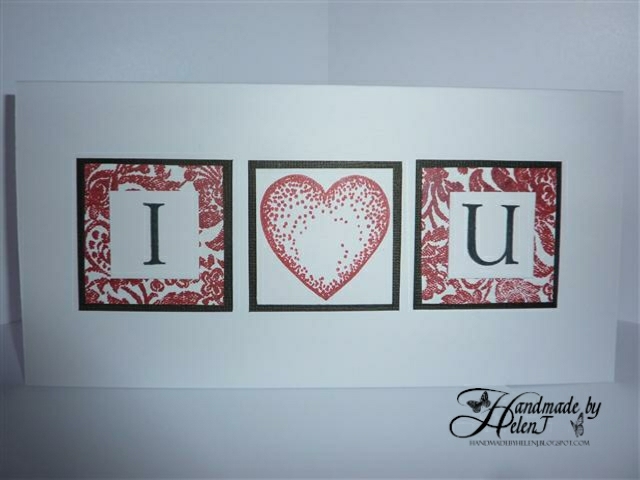 Heart stamp free with Craft Stamper magazine. Background stamp by Darkroom Door, letters Papermania Serif Alphabet. This card was for one of my Goddaughters, Jemma. 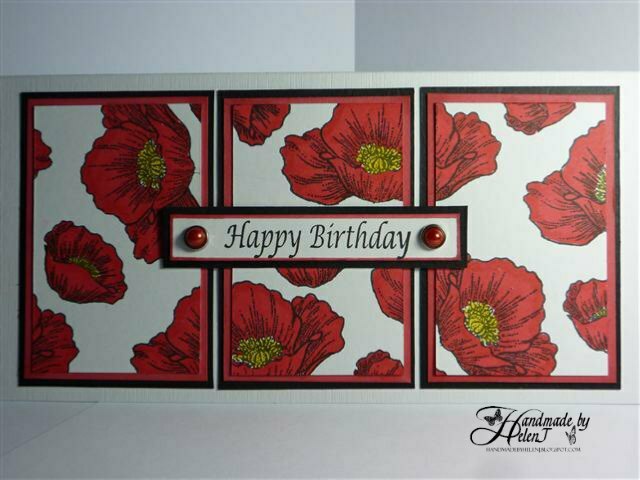 The poppy stamp is from Inkylicious; I stamped it randomly on a white panel then coloured with Poppy (obviously!) Promarker. The central part of the flower was coloured in yellow pencil. 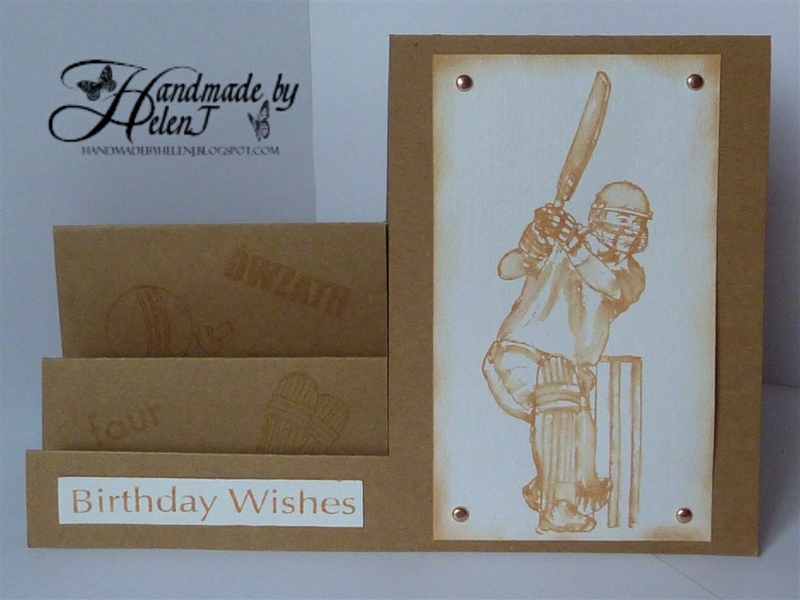 Stamped greeting, brads to finish. 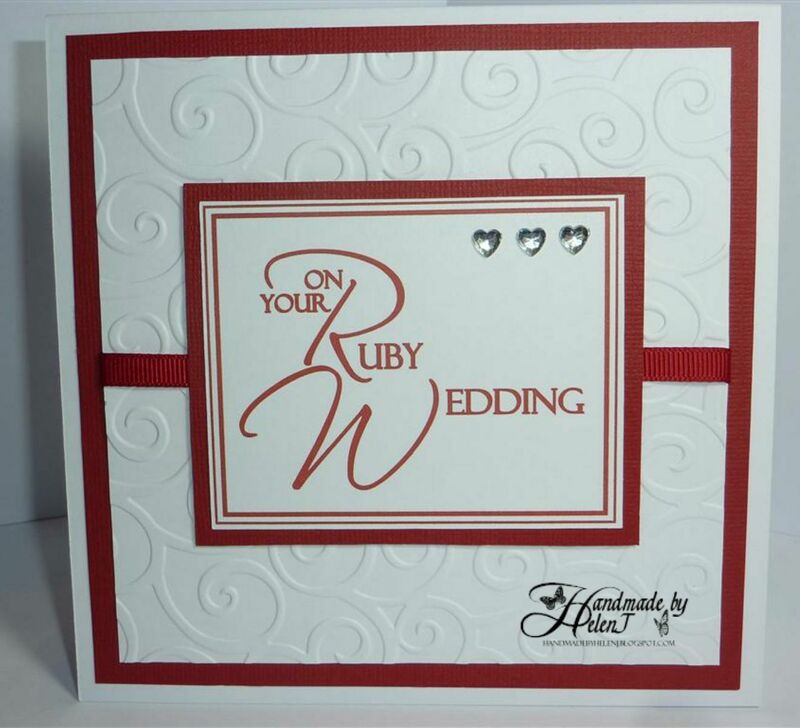 Card size 21cm by 10.5cm. The image panels were 5.4 by 8.6 cm, red panels 5.9 by 9.1, black 6.3 by 9.5.